Veronica’s screenshots set my mind afrenzy this morning in anticipation of the BC content. 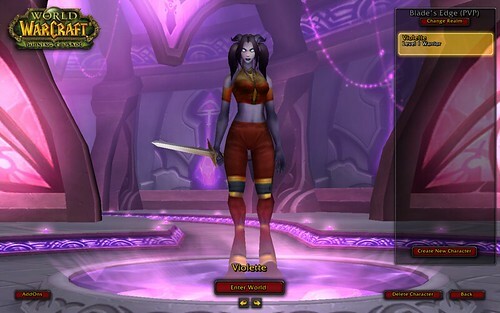 However, with the massive changes coming, specifically to PVP, I got to thinking… what content should I be focused on with my main until the expansion? Am I spending a lot of time now on content that will be obsolete in a month? The upcoming Hunter talents and spells have been announced. My other 60 is a Hunter (that sounds like a good bumper sticker), so I thought I might be qualified to make a few comments. First up; Snake Trap! 15 seconds of snakes attacking stuff. Oh, and apparently there’s going to be a few changes to the way Hunters work, specifically; you can lay traps during combat. So, basically, whenever you’re bored you can throw a bunch of snakes on the thing you’re fighting. There’s a sweet mana regent aspect that I expect most hunters will have on during raids. Oh, and there’s a misdirection spell that directs the aggro from your next three shots to a target raid member. An aimed-shot crit, a distracting shot and a multishot should mean that the tank won’t have to worry about keeping aggro for a while. Go check it out. “The New Golf” is old news. Yeah, World of Warcraft has some of the social elements of golf, and that context for chatting about business while doing something you enjoy. But I’ve always thought it was a bit of a stretch. Then again, I’m not a golfer. So maybe I just don’t get it. Then last week in our guild forums someone started a thread “We K(No)w — Real life opportunities”. I wasn’t too interested, even though I’m poking around for my next professional gig. So I didn’t even bother to look at it until today. Boy, was I surprised! It’s not that the content was so surprising, but my reaction to it. I really enjoyed reading about everyone’s professional lives and thier background and their employers. Despite the “new Golf” hype, this is not something that comes up a whole lot in game, and reading these posts adds a richness to these burgeoning friendships. People I know fairy well in game have careers that are fascinating ( and news to me…) and others are facing big career transitions. And lots of people are offering to help others with new jobs and career development. It’s all very human. It’s a community. And maybe, in that way, most like Golf? I thought you might all enjoy this little mini-map snapshot. My newish hunter was in Westfall, working the coast with her humanoid radar on. Now, we all know that it’s hard to pull one Murloc (jokes have been made that if they’re ever sold as a plushie they should have velcro on so when you try to pickup one you get six, like coathangers), but when I moved my cursor over the pile on my mini-map, I couldn’t believe how many popped up: 18. I think that number is higher than their actual level at the time. Get this pull wrong and you’ll probably find your other characters being attacked by murlocs the next time you log them on. So, I decided to solo Scarlet Monastery with my level 60 druid. I walked in to the first instance and started a fight with the first two Scarlet D00ds. Eight kills later and the battle is over, with three dead “outside” the instance, and thus unlootable. The reason I thought I’d give SM a go was for a chance of a blue BoE gun for my new Hunter, so seeing unlootable corpses was a bit annoying. I proceeded to nuke my way to the Houndmaster, then I stealthed through to the end to get the key I’d never got before. Solo grinding mid-level instances for BoE drops is not for druids. Hunters and mages mostly, I think. …or should I say Warcrack addict? (my husband is telling me that is the right lingo while he is DOTing Scarlet Mobs at the Scarlet Monastery with his warlock character). Yeah, I know. If you are just an average civilian instead of one of the 6 million World of Warcraft players -or their close relatives, like me- you did not get a word of what I just wrote. The story goes like this: Once upon a time I used to have a husband who liked games: from the board role-play version of the Lord of the Rings and the dinosaurs-era Atari to the X-men -each version- for PS2 and the Diablo, Diablo II & expansion pack for PC. Just to make it worst, he is a geek and works in the IT field. As for me I am just an artist; though I am pretty much computer savvy -for an artist, that is. Back to my story. This husband I used to have would play a few hours a week. He would play perhaps for an hour after dinner a day or two on business days and even arrange special “game afternoons” with a group of friends during the weekends. Trading Card Game loot rewards are out. Hail Satan! Is there some sort of industry event on at the moment? Upper Deck have announced the in-game rewards for their WoW trading card game. Rewards come in two flavours: Rare cards with a direct reward, or a loyalty points system for buying heaps of stuff. One of the rare, actually “legendary” card rewards is a pet (pictured right), so there goes my paycheck. And a couple of the points-based rewards are trinkets (one fires fireworks, one makes you look like an orge), so I’m screwed there too. Basically, it is as Penny Arcade predicted; the most evil product ever. I’ll be trading in all my other trading card game stuff for this. Seriously. It’s already in a pile, ready to go. The cool version of the Burning Crusade box has been announced. This prompted a range of reactions amongst my friends and I. One friend immediately rang a local EB’s, who had been receiving calls about it all day. He had pre-ordered the boring version, but apparently everyone who had done this with EB’s would get a call offering them a chance to upgrade their pre-order (which is an upselling job I’d actually like to have). Myself and another friend had both put off the pre-order, assuming that either it would be plenty available, or purchasable on-line. We are both now considering pre-ordering the CE, but for exactly the opposite content. I want the in-game pet, the trading card game samples and the mouse mat. He wants whatever the other stuff is. Still, no one has a firm release date for the product. My current pre-paid card runs out at the end of this month and I’m not renewing until BC is out.